Space Invaders Alarm Clock—Bew Bew! Mornings can be a rough time for some people. I blame the traditional alarm clocks with their silly radios or annoying beeping. 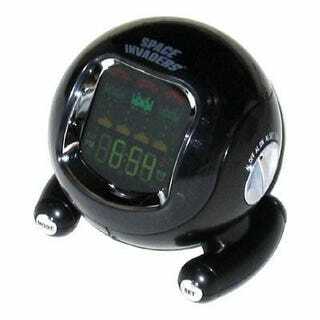 The Space Invaders alarm clock could cure my case of the mornings by awakening to the pleasant sounds of space invaders. It is available for $34, but looks like it will have to be imported to the states.